﻿I'll admit it - I've never been much of a Facebook visitor. I jump on to confirm a new friend and jump off again pretty quickly. But all that is going to change. I'm starting to realise what I've been missing! Lots of you are sharing photos and news on there and of course I want to be right there with you. For some reason, I just haven't signed up for Facebook yet. It's been in the back of my mind lately because so many people are now posting the things happening in their lives there and then assume everyone knows it. Hmm, may have to finally break down & sign up. I'm rubbish at Facebook, but I need to keep my account so that I can keep an eye on DS and DD! I rarely post on it, but do enjoy reading from time to time. 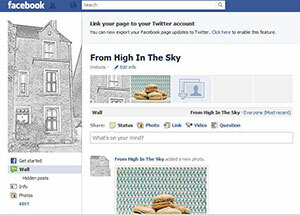 Will pop over and "like" From High In The Sky! You have kind of converted me to Pinterest though ... I think I now have 40 pins!!!!! Another face book avoider here - mainly because i get confused! However in the space of a week two crafty friends have joined so maybe I need to be brave and take the plunge. I really do need to get to grips before the oldest DD starts using it so I can keep an eye! Oh, well done for getting brave. Don't forget to take a good look at the security settings - they are a bit tricksy. I have a Page on Facebook, called LizzieMade, so I have "Liked" your new page twice! Take a flip through the list of pages I "like", I'm sure you will find a few crafty folks to interest you, Sian. There are some talented people there! I've only recently joined Facebook....or should I say....DD2 joined me....put the photos up...everything,in fact!!! I spend too much time on the net already...so doubt I'll use it much....but 'never say never'!! I do have a FB account but I never use it. Hmm. Might have to change that. I've been enjoying catching up your last couple of posts. Love the photo effects with the macaroons, and would like to weigh in on the Storytelling Sunday issue as well - please keep it going somehow, it's one of my favourite things in blogland. Last, I've been meaning to pop by and say how much I loved your Scrap365 article. I'm glad you didn't lose the old pages, and was inspired by the idea of recreating the old while still keeping it. Best of both worlds. Good luck with the separate home page. I've got likes on Shimelle, Ali Edwards, Simple Aussie Girls, Designer Digitals and Debbie Bliss to name just a few. ummm! I have an account, but don't get too involved on it. good luck with your fan page! I'm another non-FBooker I'm afraid...hope I don't miss to much! Wow, did you expect to get this kind of reaction? I have liked your page on FB and added you to my group of Scrapbookers. Love to hear if you like the results of having your page and if it is worth the effort.